I grew up seeing it all the times in the Philippines. I even wrote a CultureMutt post about it a while ago: ugly old white guys with hot Filipina girls. Although it was surprising at first, you got used to seeing it. As soon as Jammie and I landed in Thailand we started to see the same thing here. Only it was even more prevalent. AND it felt like there was an even seedier undertone. 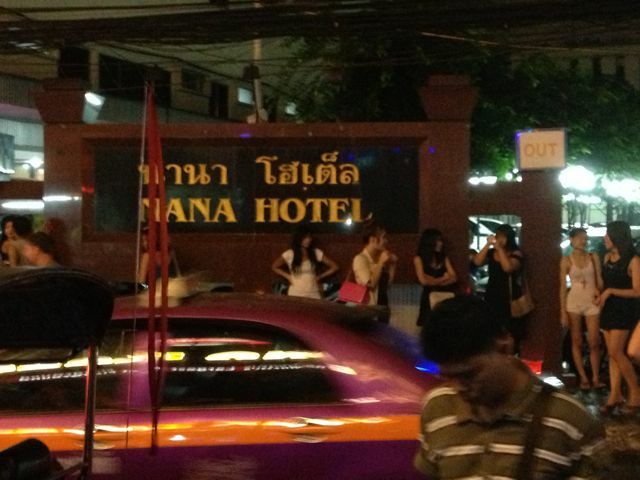 Worst Case Scenario – As depressing as it is, it needs to be said: prostitution is alive and well in Bangkok. 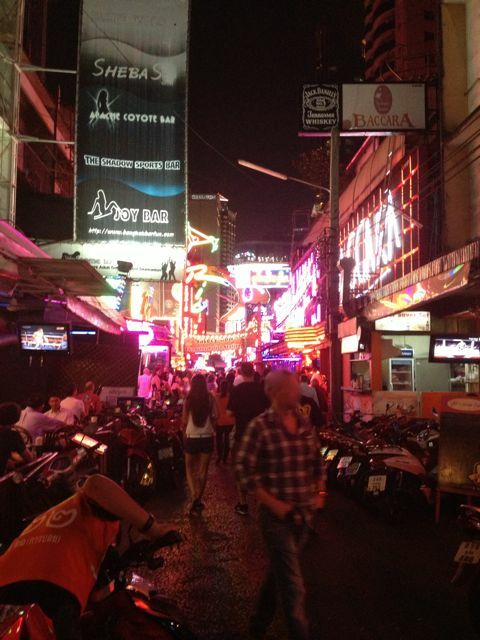 Areas like Patpong, Nana and Soi Cowboy are teeming with sexpats and Asian prostitutes. For many, prostitution has become a form of modern-day slavery. Jammie and I will be collaborating with a group that is working to prevent child prostitution later during our stay in Thailand. Key to solving the problem is presenting viable economic alternatives to families. Prostitution has often been seen as the most lucrative profession for young women with little education and other earning options. One of the best ways to fight prostitution is to present better ways to earn a living. White Men are Seen As Affluent – A lot of older white men in Thailand are traveling on little more than their Social Security checks. Although this is not much to live on back home, this income puts them in a higher income category than most Thais. So the stereotype of the wealthy white foreigner is understandable. Just as rich guys in the West attract hot women, white men here are seen as wealthy and therefore attract hot Thai girls. Better Living in Thailand – The dollar or euro stretches far in Thailand and the average old white guy looking for a hot Thai girl is going to live at a relatively high standard of living while they are in Thailand. Even if there is nothing else in the cards, this alone will motivate some Thai women to want to be with tourists. A Way Out of Thailand – Here’s the bigger goal for many Thai women: go home with the tourist. As in all the way home and out of Thailand. And that’s how you get old white guys hobbling around with hot Thai girls back home. It looks crazy but when you understand why it happens, it starts to explain things. They Actually Prefer White Guys – This part came as a bit of a surprise to me. And it’s good news for white dudes wanting to snag a hot Thai girl: she may actually prefer white guys. For reasons other than just finances. What are these reasons? Keep reading. They Think White Men Will Be Better Husbands – It is a sad nonsecret in Thailand. Married Thai men often have mistresses. Now obviously marital unfaithfulness is not exactly rare in the US or Europe either. The difference comes in the degree of social acceptance of mistresses. It happens a lot in Thailand. Much more than it does in Western countries. And Better Boyfriends Single Thai guys often have lots of different girls going at the same time. Again, I’m not saying that you don’t get a lot of players stateside but the idea of only having one girlfriend at a time is more of a cultural norm in the West. Thai women know all this and therefore many of them prefer the farang (foreigner) because he is more likely to be faithful. They Find White Guys Exotic – Here’s a crowd pleaser to end with. Whenever you are up against a numbers game and a certain kind of man is a rarity, the laws of supply and demand come into play. One trend that I have seen more and more of over the years in Asia is hot local girls with equally attractive foreigners. At least part of the reason for this is a much more “normal” one: opposites attract and because there aren’t a lot of foreigners around they are a bit of a catch. Over to you: Are you in an interracial relationship in Thailand or Asia? Or do you know someone that is? How would you add to the above list? I’d love to hear your thoughts in the comment section.